Discounts are available for DBCO-dT! DBCO-DT and DBCO-TEG modification has a setup charge of $250.00 per order for special synthesis reagents. DBCO conjugation chemistry is based on the reaction of a dibenzylcyclooctyne (DBCO) linker with an azide linker to form a stable triazole. The dibenzocyclooctyne group (DBCO) allows Copper-free Click Chemistry to be done with live cells, whole organisms, and non-living samples. DBCO groups will preferentially and spontaneously label molecules containing azide groups (� N3). Within physiological temperature and pH ranges, the DBCO group does not react with amines or hydroxyls, which are naturally present in many biomolecules. Reaction of the DBCO group with the azide group is significantly faster than with the sulfhydryl group (�SH, thiol). 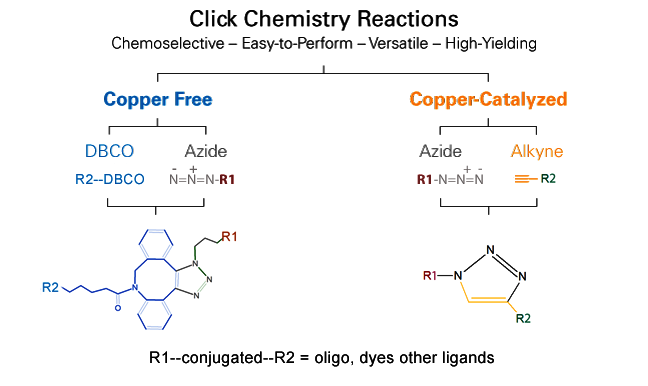 Cyclooctyne-based modifications offers the ease of copper-free click reagents. These are simple to use and has excellent click performance in 17 hours or less at room temperature. Gene Link offers 5'-DBCO-TEG for preparing oligos with 5�-DBCO and a 15 tom triethylene glycol spacer arm, DBCO-dT for inserting a DBCO group at any position within the oligonucleotide and DBCO-sulfo-NHS Ester is also offered for post-synthesis conjugation reactions. DBCO-modified oligos may be conjugated with azides in organic solvents, such as DMSO, or aqeous buffers. Depending on the azide used, the reaction will go to completion in 4-17 hours at room temperature.